The arena is one of the most important elements of any equestrian facility. This is where your beloved horses are trained. This is where they will spend a good deal of their lives working with you. It only makes sense that you would want an arena that provides the ideal combination of security, comfort, and value. Maintain climate control and ideal riding conditions year-round with an energy efficient riding arena. Pre-engineered metal is weather and fire resistant and protects against rotting, mold, fungus, and pests. An environmentally friendly choice, steel arenas are expandable and easy to erect. Enjoy unlimited design options and warranties of up to 25 years. Plus, prefabricated arenas will save you up to 40% in building and insurance costs! The type of riding being done in your arena will determine its required size. For example, a standard multi-purpose arena is around 20m by 40m (130 x 70 feet), whereas a driving arena is typically 40m x 80m (130 x 260 feet). The larger designs listed below are also considered standard sizes. An indoor riding arena makes a great addition to a custom-built horse barn. In typically cold areas, barn and arena combinations are actually quite the norm. Many horse riders and trainers find it convenient to build horse arenas on their property, particularly if they have several horses for sale at any given time or have to travel to locations for training. Many horse trainers will find that they have to lease a block of stalls in their steel building just to care for the animals. An indoor arena may very well be a profitable and convenient move. This construction method doesn’t require a heavy investment or any special skill in construction work. Metal arenas, sometimes called modular or prefab arena buildings only require minimal installation (erection costs are usually 50% of a traditional wooden structure) once they are shipped. Modular equestrian facilities are pre-built in the factory and are then assembled on-site. Buildings can be supplied in kit form for self-build construction. DIY construction will again save you approximately 50% on your total build cost. Should You Build Your Own Arena? Most experts agree that it’s best to talk to someone who has experience in managing an indoor horse arena. One thing to consider is that most people who own an indoor riding arena spend a great deal of time and money on facility management. This means that they personally will take on the role of manager or they will hire someone to do so. An arena is not a part-time project but will require consistent care. The good news about prefabricated arenas is that they require very little maintenance compared to a wooden structure i.e. 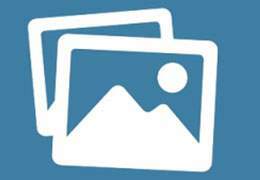 no painting, replacing roof shingles or broken boards. Most buildings come with a minimum 25-year warranty. Taking on the project of an arena yourself might mean that you have to limit your time as a horse trainer or riding instructor. You will also have to arrange for the animals’ care throughout the season, including all necessary additions to the arena such as lighting, heaters, insecticides and water systems. If it snows frequently in your location then snow removal will be another important task. In deciding whether building an arena is profitable, try and write a small business plan, as to how you would care for the regular upkeep of the covered arena, as well as any financial data you find for a possible income-producing business. If you lack the time or resources to do this you can always contact a financial consultant who specializes in small businesses. A covered arena may be the right move at this point in your life—but make sure you do the math first! A good foundation will ensure longevity and durability regardless of weather conditions. If you’re building on a flat spot of native soil with no base material or grading, contact a grading contractor before adding new surface material. Their special equipment and expertise are highly recommended to excavate, grade, roll and fill the arena. Achieving optimal footing is an art and science in itself. Once both the size and location have been determined, shop around for the very best price for your arena. Buildings Guide is happy to help you with this process. Our free, quick, and easy online form will have manufacturers competing for your business with project proposals and factory-direct prices – get quotes now. Save yourself time and research and leave the work to us! We’ll connect you with the right people who can most accurately assess your situation and give you exactly what you’re looking for. There are a few important points to consider when planning your project. The footing of an indoor arena will determine the quality of the ride, not to mention affect miscellaneous issues like dust control. It is recommended that builders take time to improve the quality of the sub-base layer, that is the material under the footing (such as packed and graded native soil, shingle etc). You will also have to invest in pesticide control and plenty of equine supplies. 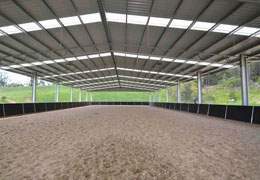 When you are building a covered arena then you will want to plan for as much riding space as possible. You may not think you need a jumping arena right now but you may in the future. The best advice is to build as large as you can afford. In construction, steel is the ideal method of building, since it has a high strength-to-weight ratio and precision engineering. You will also benefit from having the largest open-space, column-free design, which means that there will be less clutter and more area for equine training & riding. This extra space in the riding arena can be used for additional stables, bleachers and storage. Of course, the major consideration is if you have the capital necessary to create your own arena. You could plan for additional income by taking in boarders or increasing the number of horses or riders in your building. Another factor to consider in creating your own arena is that of marketing. When you devote yourself to such a major purchase, you are essentially starting your own small company. This is particularly true if you plan on producing additional income. This means that you must invest in marketing plans. Perhaps associating with other trainers will prove to be a good business venture. You will also have to look into liability insurance for your property, as well as for any category of animals that will be kept on your property. Ease of construction is one of the decisive advantages of building with steel. Steel buildings can be delivered to your site pre-drilled, cut, welded and ready to assemble. Most pre-engineered steel buildings include a complete set of all the components required for construction. This includes an instruction manual, and the washered bolts to join the individual components together, like a large 3D jigsaw puzzle, to form the structure in a step-by-step method. The components are cut using computer technology for maximum accuracy and a perfect fit. Since 70 percent of the work is done on the ground, many consumers are able to build the structure themselves, saving big money on labor costs! Covered arena prices – what can you expect to pay? Remember, that some of the smaller arena buildings are available in building kit form suited for self-build construction; this labor-saving could save you approximately 40% of your total construction cost; something you probably will not get with a traditional wooden structure. If the above price estimates are within your budget why not apply for four free quotes from our suppliers to get you started. Building your own covered arena can be a complex project and will no doubt steal time away from your primary job of training horses. For one thing, in addition to working out the specifications, you will have to check with your local government or municipality regarding zone issues & permitting. Some localities will consider a horse arena as a commercial enterprise, while others may only see it as an agricultural property. Contractors will focus on improving the base material installation under the footing. The base of the riding road will be supported by a sub-base area of packed and graded native soil. This design is comparable to road building, in that much of the cost of this project will be in site preparation. The basis of this design is that this layer will keep the surface and groundwater from affecting the base area. Another frequently reported problem is that of dust control, particularly arenas that connect to barns. Again, this problem is traced back the type of arena footing you choose to use. Some experts have even suggested using footing like rubber to improve the problem. Horses need a great deal of natural lighting and good clean air. They instinctively stay away from dark places or strange spots on the ground. 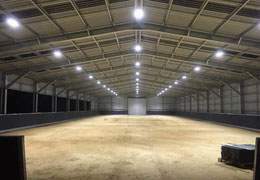 A horse barn or indoor arena with no drainage, with unhealthy soil, improper manure management, or a lack of lighting will not be a livable environment. It is recommended that builders and buyers ensure that their property has clear or translucent wall panels and windows. If temperatures rise or lower to extremes then thickness panels may be required for better insulation. Along with these provisions, air chambers can help with ventilation. You also need to make sure that there are evening and nightlights. Some designers fault roof skylights, as they result in leakage. Therefore some experts have recommended putting wall light panels in clerestory or in a monitor roof atop the ceiling. This protects against leakage and provides for a better environment that a horse will enjoy—free, breathable and well lit. Look for these features whether you are planning to construct steel buildings or horse arenas on your own, or are buying a property outright. Even with improved modern pressure-treating methods, treated lumber is still full of chemicals. Not only can these leach into the surrounding environment, but they are also prone to off-gassing and they are poisonous to consume. The dilemma that this creates is that using untreated lumber in areas that are susceptible to chewing or cribbing, as Malmgren recommends, opens these boards up to mold, mildew, rot, pest infestation, and fire damage. So using wood framing components puts the owner into the unenviable position of having to choose the lesser of two evils. The use of building components completely eliminates these issues. In fact, not only does metal solve the treated/untreated lumber conundrum, it also makes the entire problem of chewing and cribbing moot since horses will not chew on it. By its very nature, a riding arena must be open. Nothing makes proper training more difficult than obstacles such as columns and posts standing in the way. Modern pre-engineered buildings have been designed to eliminate these obstacles, using a structural system called clear-span, an entire building can be supported by its outside walls. Not only does this create the ideal climate for horse-training, but it also eliminates shadows and makes for a spook-free environment, in a completely secure space, due to the stability that is engineered into them. Unlike pole buildings, prefab buildings allow for the maximum amount of unobstructed riding space. Buildings can be engineered to be 200 feet wide with infinite lengths. 1,2 Horse Stable and Riding Arena Design, by Eileen Fabian Wheeler, January 2006.